A barrier to change is split responsibilities within the real estate sector but traditional positions are now being challenged. Valuers are changing their position from paying a premium for green buildings to discounting because the building is not performing well. Figure 1. Studies on the rentable value for green buildings – reproduced from ‘Business case for green building’, World Green Building Council report, 2013. This is supported by the increase in rentable value shown by studies to be a maximum of 25% with an average of between 5-10% (see Figure 1). 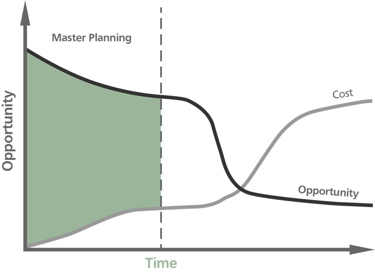 The earlier clients engage with sustainable design principles the more chance you have to influence the sustainability of the project at a lower cost (see Figure 2). At the planning and pre-design stages there are opportunities through economies of scale, site-wide solutions and greater flexibility in design or decisions to be made. The benefits of high performance buildings can be realised by the use of certification, such as one of the types of BREEAM. • One step ahead of legislation and industry best practices. However, the operational phase of a building has an enormous impact on long-term performance. Around 80% of the lifetime costs of a building are embedded in the operational phase. 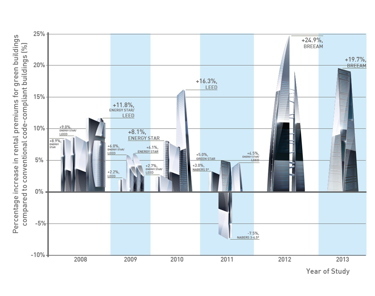 What’s more non-domestic buildings have a design lifetime of 20 to 40 years. In the UK, newbuild commercial properties are only 1% per annum of the total available, so the majority of stock is in the operational phase, with its associated costs. • Tenants renegotiating rent values based on maintenance issues. With these issues in mind, it’s useful to consider certification such as BREEAM in Use (BiU) or the Non-domestic Refurbishment and Fit-Out BREEAM standard (RFO). Sustainable certification has been shown to have many benefits for existing buildings:11% reduction on operatingcosts; an average 13% emissionreduction; and a cut of 15% onenergy costs. A growing body of evidence demonstrates that sustainable commercial buildings that are well operated offer better return on investment for owners and landlords. What’s more, there is now a clear shift towards the attitude that sustainable and energy efficient buildings are the ‘norm’, particularly in the premium office market. Buildings that don’t offer these characteristics can expect lower rents (known as the ‘brown discount’), especially in the London office market. Third party certification offers a common language for clients, designers and building occupants. It enables the construction team and end-users to understand what outcomes to expect from the design process. Certification is also helpful for existing buildings, offering a focus for refurbishments with sustainable and energy efficient outcomes, providing benefits for all. Dr Andy Lewry and James Fisher are principle consultants at BRE; Matt Holden is economics consultant.